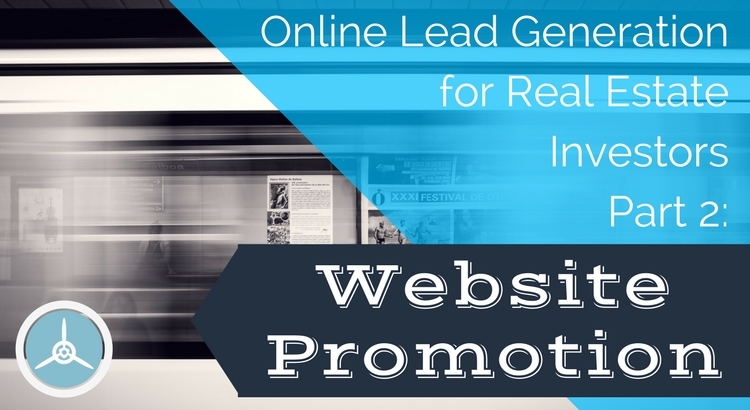 This week we will be talking about website promotion for your real estate investing website. Last week we started our talk about generating motivated seller leads online. You have to get a high-converting website that is set up to rank well in search engines. You need to promote your website to start generating traffic and leads right now. Work on getting your site to rank faster in the search results. If you need to know the beginning steps of website promotion, we wrote another blog about having a high converting website. We talked about 2 ways of generating leads online – inbound, and outbound. The majority of the article focuses on inbound because that’s where the best leads come from! We covered how to make sure your website converts visitors into leads at a much higher rate. All of what we’re sharing during this online lead generation article series is from Danny’s over 10 years of generating thousands of motivated seller leads online. So, let’s get going and talk about how to do the best website promotion to start generating leads right away without waiting for your site to rank at the top of the search engines…which can take up to a year with diligent effort. The internet isn’t the field of dreams. Just building a website doesn’t do anything for you unless people know about it. They either find out about it through promotion: which is what we are talking about in this blog and the next one. The biggest mistake real estate investors make with a website is getting it and then doing nothing with it. Website promotion does require some work, but the results can land you great deals that generate tens of thousands of dollars. Whenever I hear someone say, “I haven’t receives a single lead from my website,” it’s almost always because they never promoted it or didn’t promote it long enough. It’s the equivalent of complaining you didn’t get a deal from your direct mail campaign after you sent you 500 postcards once. You Need a Plan for Website Promotion! Just like you plan your direct mail with who you are mailing, when and how often and which letters, you need to have a plan to constantly promote your website. You wouldn’t print 1,000 letter and never mail them, so don’t build a website without a website promotion plan for it. Social media is a great way to share with your friends and family what you’re doing. Don’t be that investor that’s embarrassed to tell the world that they buy houses. You never know who has a situation they are too embarrassed to share with everyone, but will go to your website and submit their information. “Know anybody that wants to sell their house for cash? Visit our site at [insert URL here]. We can help! You should regularly post posts like those above. Obviously, mix it up and add in stories about flips you are doing, or you experiences with customers, etc. But always, always, include your URL and post links to those blog posts you’re doing for the best website promotion plan. That is what is known as content marketing. We’ll cover this in more detail in our next post, so stay tuned! Add your website to all of your social media profiles. All of them. These are the profiles where you have your name and short bio about you and your business. People need to know what you do. Let them know about your website! After all, that’s where they’ll get direct contact and information from you. Using your email signature as a way to promote your website, even if the emails are going to people you don’t think would be interested, is a great way to start getting your website some exposure. You can’t be an investor in stealth mode. And you never know who will be interested in buying, or selling. With your website URL in the signature of your emails, your website has the potential to be seen and shared with more people. You should have your site on your other marketing for website promotion. This can be your direct mail postcards, letters, door hangers, flyers, business cards, etc. We don’t recommend bandit signs with websites on them. Bandit signs are better for your business number where someone looking at the sign can call immediately. Some people don’t recommend websites on direct mail because they are concerned that sellers will go online and get distracted. That could happen. Our take is that if they’re truly motivated and don’t want to call someone, your website will work very well. It will allow you to gain credibility and build some rapport. This is also a reason for wanting a somewhat short domain name. You don’t want to have to make someone type out webuyallkindsofhousesinthestateoftexas.com just to get to your site. Keep it simple. Some investors add QR codes to their postcards and letters so that people can scan them and have them go straight to their websites. There probably isn’t much of an issue with people going online to your website and then going to Google and search for competitors. The issue is people searching for your domain name, and getting other results because they didn’t type it in as a domain name. So remember, keep it simple. This is also a reason to make sure you set up a FaceBook page, Google My Business page, a listing on Yelp and other review sites. It’s important to also socially promote these. This way, if someone does search for your business, you can dominate the page results! Press releases sort of fall into the SEO strategies more so than promotion but we’re going to include it here anyway. The reason why we’re including it here is because a good press release can get picked up by reputable news websites that you can then list on your website. A ‘as seen on‘ type deal. This is hue for credibility. Street cred. You can find incredible press release writers on Fiverr.com. They should be cheap enough to try a couple and use the best ones. Some of the Fiverr gigs even include releasing the press releases. We have found that spending a coupe hundred bucks on a more legit service to release the press release is worth it. I know a lot of investors use marketersmedia.com. PRWeb.com is another and is the more expensive service. The biggest thing to remember when having a press release written (or writing one yourself – as Danny used to), you really need to try to come up with something that is actually newsworthy. Just having a piece written on “Sell Your House Fast” isn’t going to get picked up in too many places. You need a story. Something like, “Guy loses hand in pinball machine and sells his house fast to an investor“…or something like that. This is much harder than you’d think. The more “newsworthy” your press release is, the more legit news websites will pick you up. One time Danny even made it onto Yahoo News, and it was great for his website’s promotion. Despite what you may think, motivated sellers are searching Craigslist, so it’s very easy to get in front of them. Sometimes they’re looking for a place to rent, other times they’re considering putting their house up for sale and might want to post an ad on Craigslist. It’s easy to post ads on Craigslist. But, with ease comes competition. Other investors also post to Craigslist, but you can beat them by being more consistent – meaning posting daily. Always. Here’s the rub: Almost every serious investor has posted ads on Craigslist for deals from motivated seller leads, but I can guarantee you that only about 0.1% (yes, a fraction of a percent and yes…that is just an educated guesstimate) are consistent. You’re probably asking yourself if posting ads on Craigslist still works. Let your competition think that way. I know someone in San Antonio that posted a craigslist ad and landed their first deal that ended up netting them $100,000 in profit. I’d say that’s worth posting free ads consistently…all the time. I was kicking myself for not having ads on Craigslist. Your ad’s headlines should draw attention and speak to people that would want to sell their house fast because of a specific situation. If you focus on writing ads that target motivated seller leads in these situations, and present yourself as a problem solver for people, you’ll grab their attention even amongst all of the clutter. While you should have some general ‘We Buy Houses’ type ads, you should also include these situation-based ads so that you stand out from the crowd. Many people inherit houses that they have no need for. It’s tempting to want to hold on to the house because of the memories, but sooner or later, the cost and time involved in maintaining that house takes its toll. If you’re considering your options, why not get a no-obligation cash offer from us to buy your house as-is? That means, we will buy it with cash so that there are no formal inspections, appraisals, or real estate agent commissions. And you can sell it without making a single repair! There’s no obligations! You can get an offer without paying a fee or committing to anything. Many motivated sellers checking Craigslist are viewing the listings as thumbnails. You should have an image created for each as that draws attention and shares your message. You read that correctly. We don’t care about the location, repairs needed, or situation. We will make you a no-obligations cash offer to buy any house. Can you relate to one of these situations that we routinely help people with? Inherited a house that you don’t need? Too many repairs and no desire to fix it? City complaining about repairs needed and can’t afford to fix it? Don’t feel like paying a Realtor thousands of dollars in commissions? Don’t want dozens of strangers visiting your house if you put it up for sale? …or any other situation? Don’t worry, we’ve probably encountered it, and helped the seller through it by making a cash offer to buy the house fast! We’ve been helping homeowners in San Antonio sell their house fast without hassle for many years. We are a Better Business Bureau accredited business that always operates professionally and ethically. We care about making sure everything goes smoothly and that you are informed through the entire process. Note: Obviously, you’ll want to swap out San Antonio with your target city, and remove the bit about the Better Business Bureau if you don’t have a BBB accredited business. You’ll want to post to Craigslist for the areas you are investing in. Be sure to include smaller towns and cities within your area, not just the main city. For example, the San Antonio area could also include: Selma, Universal City, Helotes, Poteet, and Castle Hills. Doing this will allow you to be seen where there is much less competition for motivated seller leads. PRO TIP: If your ad relates to houses that need repairs, you can target people looking for tradespeople in the “Service > Household Services and Services > Skilled Tradespeople Services” sections. Here’s Where People Mess Up! They post an ad or two and then wait. They wait, and wait, and wait, and then forget about the post and never do anything with it again. Let me save you some time in figuring out when and how often to post ads. Post 3 ads from each account to the different sections of Craigslist mentioned above. That’s a total of 15 ads posted on the first day. On the next day, duplicate and slightly modify all your ads with different headlines. Change up the body text a little, and change the pictures, then post the altered ads. Now you have 30 ads posted total. On the next day after that, you should be able to log in to your account and renew the first day’s ads. This keeps them fresh and at the top of the list to be seen more often. The reason you want to continuously post ads so often is that the newest ads show up at the top of sections in Craigslist. If you are in a city with a lot of people posting, your ads won’t be visible on the first page for long. Best times to post are when people are typically looking at Craigslist. Most people post first thing in the morning, but that’s not really when people are looking. I recommend posting around employee break times, such as 11:00 am – 1:00 pm, and in the evenings around 4:00 pm – 7:00pm. It may seem daunting, but after you create your initial ads, it’s just a matter of reposting them. You could even hire this out for pretty cheap. It’s not rocket science. Outsourcing the posting of these ads will ensure that it gets done consistently, and that’s what matters. Posting once, twice, or three times is not enough. And once your ads are up on Craigslist, and are consistent, you can copy and paste them all into Backpage.com (a site virtually identical to Craigslist). This way, you will be generating motivated seller leads in no time! Also, you will most likely have some ads flagged. This is usually from your competition trying to shut you down. This is why you have several accounts and post so many ads consistently. They won’t be able to shut you down. Outlast them. LeadPropeller also offers wholesaling websites so that you can build your buyers list and list your wholesale deals. You can post ads on craigslist that drive traffic to your wholesaling site so that you can grow your buyers list by faster. If you post your deals on Craigslist, include mention of your website or an image with your website on it and tell people they can find more deals and sign up to be notified of new deals as soon as they are made available. Having your LeadPropeller website collect their contact information and information about what they are looking to buy will save you tons of time and hassle. This basically automates this process. We intended to talk about PPC in this article, but as we went on we realized it would be easier to spend the next post on it. So that’s what we’re going to do! Be sure to check in for the next bog post to get more helpful information on website promotion and building your real estate investing business! "Avoid These 10 Biggest Mistakes Most Investors Make When Trying to Generate Motivated Seller Leads Online"